Darkview: Psychosis is a paranormal horror story written by R.J. Bathgate and M.J. Hall. They recently took some time to sit down and share a bit more about the story with readers, as well as a bit of insight into who they are as people. Please enjoy this interview and then be sure to check out the story! You can even find an excerpt and the book trailer to enjoy. Please also note that affiliate links may be present within this post. Should you make a purchase through one, I may earn a small commission to help me support my websites, at no additional cost to you. R.J. Bathgate: When I lived in Canada twelve years ago, I hitchhiked from Vancouver to a small town in British Columbia, called Hope (where Rambo First Blood was filmed). I sat on an old wooden bench, it was cold, dark, and the area was engulfed by an eerie mist and a bright Hunter’s Moon reflecting off a nearby lake. It felt really peculiar and eerie, like nothing I’d ever seen before. I looked across the street and saw a line of immaculate houses that all looked clean and pristine. However on the opposite side of the street, the buildings were all decrepit and hanging off a cliff due to a mudslide. The embankment had been washed away by the river below, causing the houses to break away and become distorted. It was like looking at a dark, mirror image. It was this contrasting vision: clean, immaculate houses on one side, and broken, ruined ones on the other, which inspired me to research mental health issues and create a character with a split mind – Jack Cyrus, the protagonist of Darkview. Over the years, I’ve been influenced by writers such as Stephen King and Wilbur Smith, and numerous thriller and horror films. Jack is loosely based on the character, Randal P. McMurphy from One Flew Over the Cookoo’s Nest, and Jack Torrance from The Shining. There’s also a bit of Bryan Mills and Sam Childers – Liam Neeson’s and Gerald Butler’s characters from Taken and the Machine Gun Preacher respectively. M.J. Hall: Darkview was originally set in Canada, but it could have been anywhere in the United States or Canada. When R.J. asked me to come on board, I suggested we set the story in Scotland against the backdrop of Scottish History, or something like that. R.J. thought it was a great idea and we set about creating the world of Darkview. It’s a bit of a cliché, but you write about what you know, so setting the story in Scotland seemed a natural thing to do, seeing as we’re both Scottish. The history is Scottish and the humour is definitely Scottish! Same as our favourite character to write – the protagonist, Jack Cyrus. Inside (chapter 13). It was challenging to write and to change the writing style from 3rd person to 1st person. But we wanted the reader to feel as if was them themselves walking the path of Jack, feeling his pain and enduring everything he goes through. Psychosis is the first book in the Darkview series, so there’s a good chance one or more of the characters will be returning. Hopefully a better understanding of mental health issues. Psychosis is our debut novel. R.J. Bathgate: It goes something like this: Silence, brainstorming, drinking Mountain Dew, writing, a cigarette break, more writing, repeat. M.J. Hall: First, we brainstorm and write the first draft together. Then I go through and edit what’s been written, before passing it back to R.J., who either says ‘great’, or makes a list of suggestions on how things can be improved. There’s generally a bit of to–ing and fro–ing before we’re both fully happy with things. Follow your heart, always keep going no matter what, and never give up! The Highlands of Scotland – Glen Coe in particular. R.J. Bathgate: Skydiving at 1400 ft. Four tandem and two single jumps. I’ve jumped from the world’s largest bungee (in Canada). I’ve bungee jumped over Victoria falls. I’ve done safari in Botswana, climbed on the world’s largest glacier in Alaska. Lived in a ranch in the Canadian Rockies. I’d love to shark cage dive. M.J. Hall: There’s a multitude of places and countries I’d love to visit including Canada, Iceland; the Scandinavia, Machu Picchu, Peru; the Grand Canyon, USA and more. Take a journey into the disturbed, delusional mind of Jack Cyrus … take a journey into Darkview … a small, remote coastal town, deep within the Scottish Highlands. The sleepy, isolated spot bears a sinister, horrific history, shrouded by a chilling secret. A secret one man must unveil, which will ravage his soul … and sanity! Jack Cyrus is in damnation! After witnessing the 1994 Rwandan Genocide, he has become plagued by dark memories and devilish visions, the result of post traumatic stress. After returning home to Scotland and compounding his trauma, he is faced with the sudden death of his wife, from cancer. Lost, alone, and struggling to forget the horrific circumstances surrounding her passing, Jack has developed schizophrenia, experiencing chaotic, disturbed thoughts and demonic hallucinations. On the sixth anniversary of his wife’s death, Jack receives a cryptic, hand written letter from her, telling him she is still alive. Suffering and held captive, she pleads with him to return to Darkview, the place she spent her last days, and rescue her from purgatory. Upon arrival in Darkview, strange things start happening, and what appears to be a centuries old mystery, starts unravelling itself. Jack must piece together the clues and lost fragments of his sanity to solve the unravelling mystery. Is any of it real, or is it just a manifestation of Jack’s mind, or another facet of his schizophrenia. Buy it on Amazon Read an excerpt and see the book trailer here. 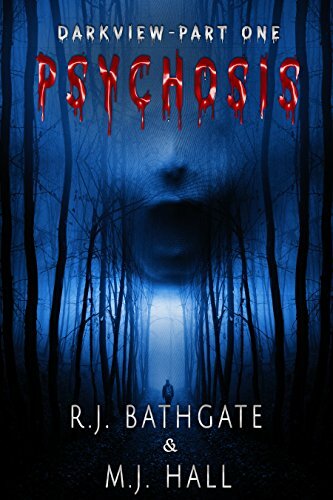 R.J. Bathgate, born and bred in Scotland, is the creator and co-author of Darkview: Psychosis. A father of two, and enormously proud of his heritage, he has studied psychology, social sciences, and is currently working towards an advanced diploma in psychotherapeutic counselling and hypnotherapy. His heart lies with new experiences and an interest into the unknown, particularly with writing. He has travelled the world from the dusty, wildlife-filled plains of Zambia, to the glaciers of Alaska, and the soaring peaks of the Canadian Rockies. He is extremely fond of NHL ice hockey, video games, good films, fine wine, and Jack Daniels. He originally wrote Darkview as a screenplay when living in Canada, but upon returning to Scotland, researched mental health issues, namely psychosis and schizophrenia. Inspired by this research, he brought in his lifelong friend, M.J. Hall, to help create a more realistic take on Darkview. The result is a story that combines traditional Scottish history with real life, catastrophic world events, told through the eyes of the protagonist, Jack Cyrus. M.J. Hall was born in Stockport, Greater Manchester, at the turn of the eighties. Despite being born in England, he identifies more with his ‘adopted’ country, Scotland – he’s lived there since he was four, and his late maternal grandfather was Scottish, too. He presently lives in Edinburgh and is currently studying Environmental Science at the Open University, but has always dreamed of a career in music or writing, or both. He is vegetarian, loves animals (especially cats) and is devoted to his black and white moggy, Tahlula. He humbly admits being just a small voice in a big chorus, and his life changed for the better, or at least would never be the same, when his lifelong and best friend – R.J. Bathgate – invited him to collaborate on Darkview.